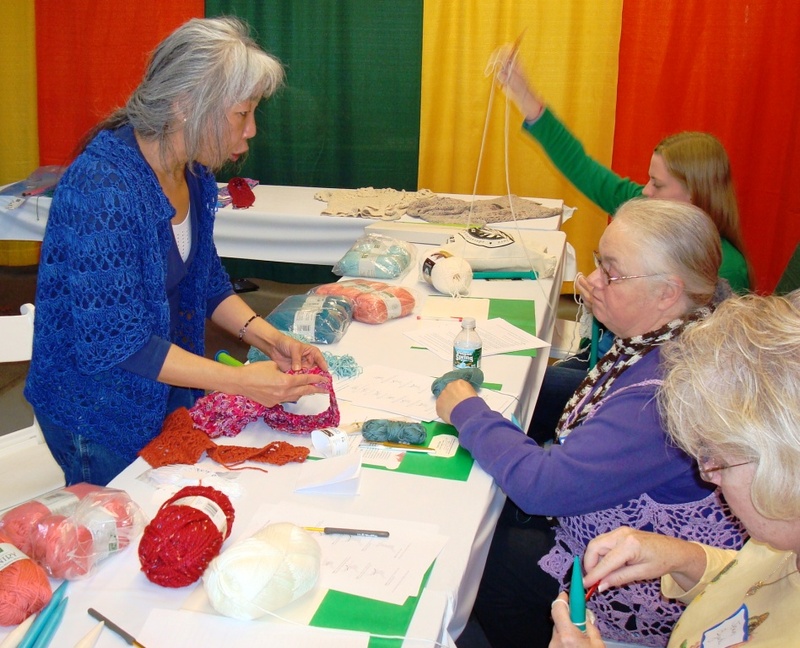 >Likely you missed the world premier of my Magical Broomstick: Crochet Lace in a Flash workshop last week at the NYS Sheep&Wool Festival in Rhinebeck, NY. My inaugural class might have been small in numbers but huge in terms of enthusiasm and spirit. Yes, it’s true. I swatched. I don’t bite. Not today, anyway! Megan, Pam, Jean and Ruth, intrepid crocheters all, joined me for a fantastic and fun flight through three approaches to Broomstick technique, tons of show and tell, umpteen swatches and not enough coffee. Thanks to my class angel Diane Moyer for capturing the morning in photos. Pam was wearing a Broomstick scarf she had already made, YAY! In a pinch, these make awesome drumsticks. After class I had the honor of sitting for a book signing at the Merritt Books author booth. 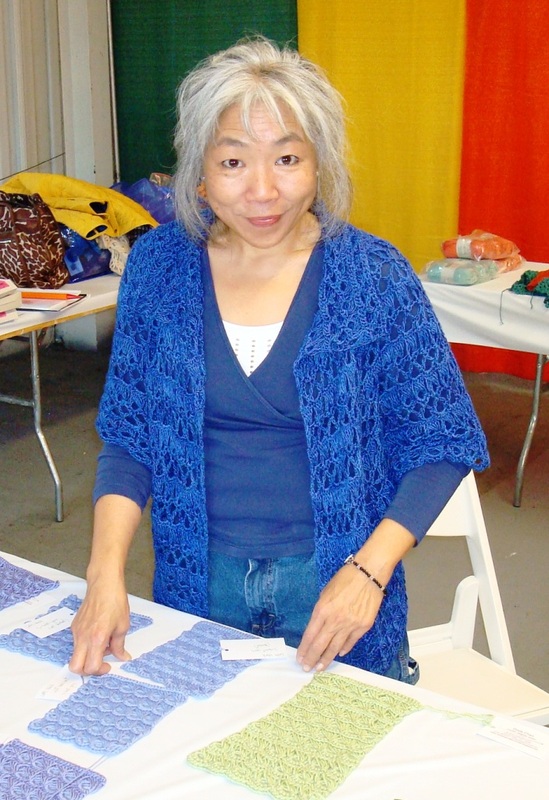 I lugged in a dozen garment samples from Crochet Lace Innovations and from my new self-published pattern line DJC Designs. Scott Meyer, my genial host, thinks I know how to work a crowd. Little did he realize that the crowd was loaded with ringers, fellow designers and crochet friends from CGOA and Ravelry. We were all having such a jolly good time that it only looked like I was impressing the assemblage. Since many of the fans stopping by to meet me already own my books, I sometimes offer to sign book plates, signatures to-go. OOOPS. Well, now that Scott knows those people weren’t all paying customers, ya think I’ll get invited back next year? Next teaching-op for me is the Chester Springs Studio Holiday Fine Crafts event on November 13th for Historic Yellow Springs, a non-profit enterprise in Chester County, Pennsylvania that preserves and promotes the history and arts of Yellow Springs village. Chester Springs Studio is a vibrant arts center that hosts classes, workshops and exhibitions in the visual arts. 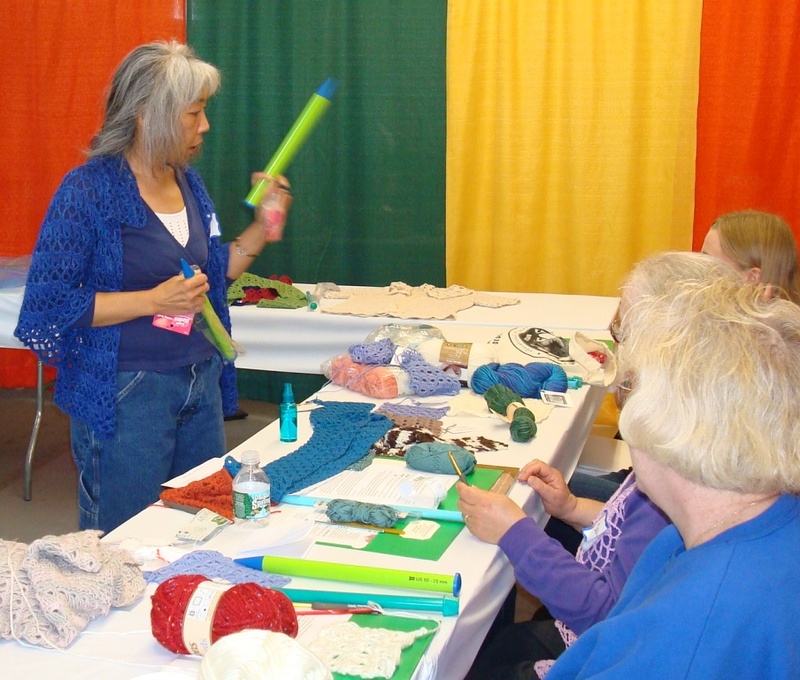 My Magical Broomstick crochet workshop is from 1 to 3 pm, but even if you can’t make the class, please stop by before and after for mini-demonstrations and crochet Q&A. Hope to meet you there. This entry was posted in Designer's Life, events, What I'm Wearing by dorischancrochet. Bookmark the permalink. >Great class! I just loved it. 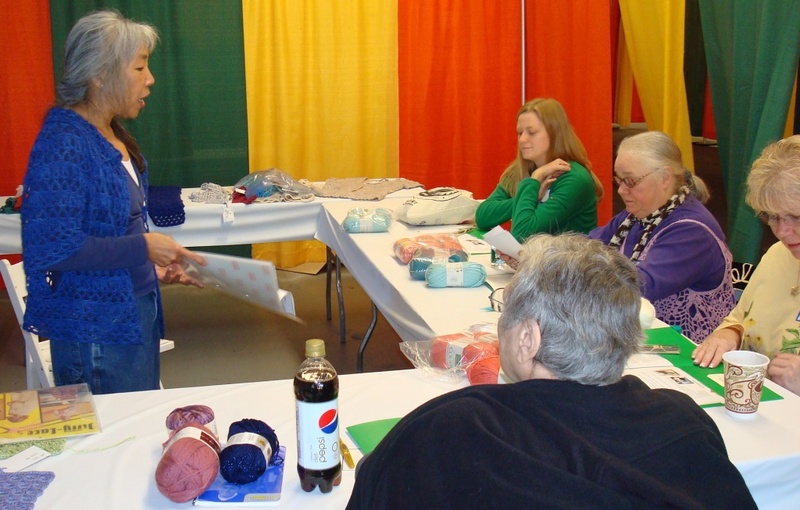 Doris was able to teach a very diverse group. >Sounds like the class was fun! Just wish there was something closer to home for me (I live in NJ). >I love the broomstick lace! I just learned how to do it and it makes lovely scarves, and purse straps. Someday you'll come to Oregon, get hooked on Portland and I can come to a class! >Hey Ms. Chan! As a longtime admirer of your work I should probably recognize it, but I'm digging the sweater you are wearing in these pix and drawing a blank. Which design is it? Much respect! >The jacket I wore during this workshop… not yet published!